The U13 boys’ team were given the option not to run. As they emerged from the minibus (where they had been waiting in order to keep them dry), the rain turned to hail; conditions were atrocious and Charlie M made the decision to stay in the bus. The rest of the team attempted to jog (bent into the wind) towards the start and had barely covered 20m before Charlie caught them up , claiming he would ‘really regret it’ if he didn’t run. For a while, we thought we were the only ones mad enough to compete; warm-up completed, the boys huddled under a tree waiting for the U13 girls’ race to finish. 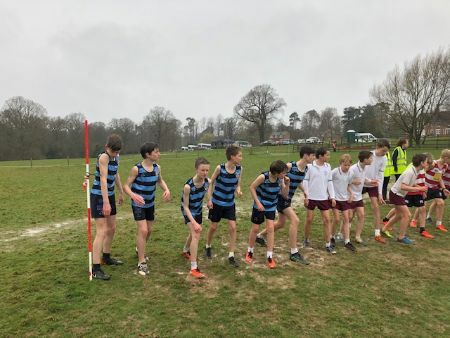 The other teams gradually emerged and, although numbers were a fraction of those normally toeing the line, there were four complete teams in the race, amongst them, the might of Sevenoaks School. AND WE WON!!!!! The boys were superb! 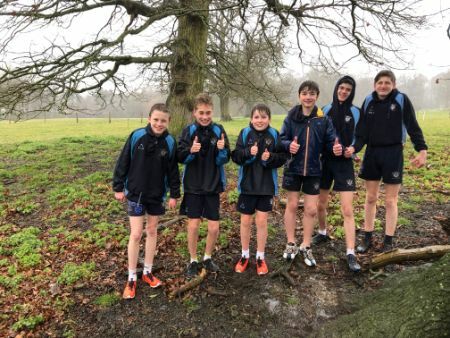 Never have I seen so much mud at a schools’ race but they battled through (Charlie M possibly regretting his decision as he fell just before the first corner), the Saint Ronan’s team having three finishers in the top ten! Charlie E concluded a superb season as our inspirational captain in 4th, with Ellison VR (a truly dedicated runner), 5th, Jasper S (we’re looking to you next season! ), 6th and Max R, the all-important fourth scorer, 18th. 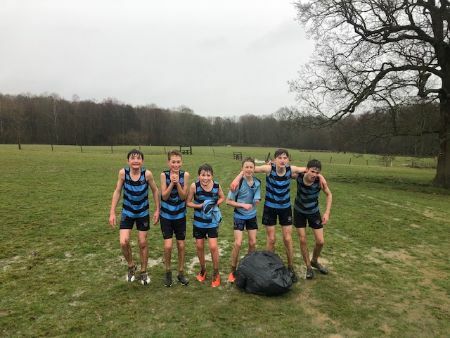 All four of these boys, along with Jamie P (I do not have his place as it was too wet to record at the end of the race) had raced in Malvern just two days before. Archie W (who had asked, and been denied the request to stay at school! ), battled with Max, each pushing the other on to conclude an excellent cross country season. Your presence, and effort has been so valued boys! Boys, you have worked so hard all season; we are so pleased and proud that you were able to finish with a win!